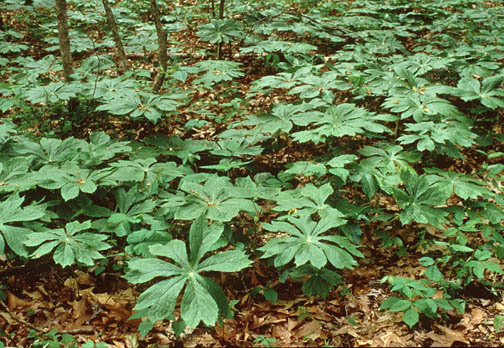 Big, umbrella-shaped leaves of mayapple sometimes carpet the forest floor. 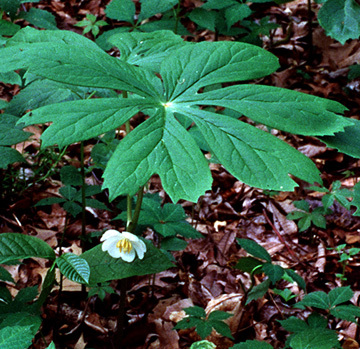 The large white flowers hide under the leaves. Look for them at the crotch of the double-leafed plants. Produces yellow fruit in May. Range: Found in moist woods throughout Indiana. Also known from Quebec to Minnesota to Kansas and from Florida to Texas.